Solar panel output depends on a wide variety of different factors, from panel efficiency, to the amount of panels in your system, to where you live in the UK, and many other things. So why does it matter how much electricity our lightbulbs use? Well it has been stated by energy conservation groups that our lightbulbs account for 20% of our electricity bills – so how many solar panels do you need to power the lightbulbs in your home? How Much Electricity Do Appliances Use? To calculate the usage of 1 lightbulb we knew that a 60 Watt lightbulb would use up 0.06kWh of electricity per hour. We decided by looking at each of the seasons that 5 hours was a good average for the amount of time a lightbulb would be on each day. This worked out as 0.3kWh per day and 109kWh per year. But Who Has One Lightbulb? Nobody! We had a look online and decided that 9 lightbulbs is a good average amount of lightbulbs for many homes and bungalows. Accounting for all of those lightbulbs we can work out that these cost us upwards of £108 per year in electricity costs! AND that is if you remember to turn them off! How Much Sun Does A Solar Panel Need? You might think that solar panels need red-hot summer sunshine to work but this is not actually true, whilst solar panels are more efficient on clear sunny days they still produce electricity on cloudy, rainy, foggy or cold days. On average across the whole year we get around 4 hours of bright clear sunshine a day, which equates to 1460 hours of sunlight across the year. (So to calculate your panels minimum output 4 hours of sunshine a day is a good place to start). So with 9 lightbulbs in our home, running for 5 hours a day on average, this means we would need 981 kWh of electricity to power them for the whole year. After this we must know the KW’s each of our solar panels can produce. So if we get a high efficiency 120W solar panel, this equals 0.12KW’s. So we divide the energy we need by the amount of energy each solar panel can produce to find out how many solar panels we need. Which means that you would need 6 solar panels to provide the electricity needed for 9 light bulbs in your home for a whole year. Most UK solar panel systems are made up of between 12-16 solar panels, averaging at around 3.5 KW’s for the whole system. 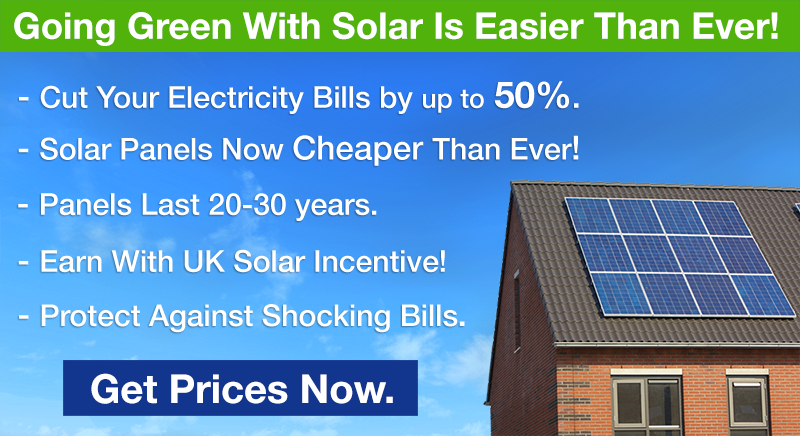 So, if you opt for a standard solar panel array you wont just be saving on the 20% of your bill made up by your lights. You would be saving considerably on the costs of every single appliance. How Many Panels Would Fit On Your Roof? BUT! We Only Use Lightbulbs At Night! Well, most of us are out of the house during the day and most of us only use our lightbulbs in the evening… but thanks to solar storage batteries you can benefit from your solar electricity day and night. A solar storage battery will store electricity generated by your panels during the day for use in the evening. As soon as the sun goes down and your panels stop generating, your solar storage battery would discharge the electricity it has stored across the day. Battery manufacturers claim that you can cut your bills by a further 50% with a solar storage battery, as you would be buying less electricity back from the grid during peak hours. How Much is Solar Storage? Author Kerry Bethany Foster, Energy CorrespondentPosted on August 24, 2016 Categories renewable energy, solar energy, solar panel installation, solar panels, solar storage batteriesTags money saving, savings, solar, solar panelsLeave a comment on How Many Solar Panels Do You Need to Charge a Lightbulb?